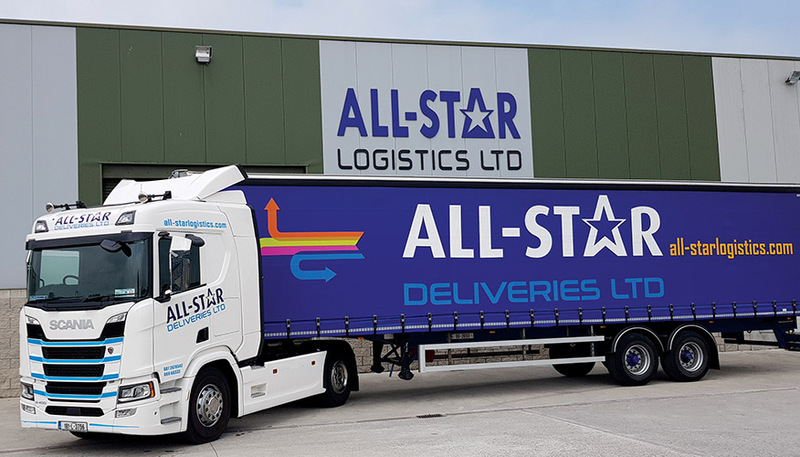 Founded in 1996, All-Star Logistics Ltd has come a long way over the last 22 years as it has gone from a one man operation to providing multiple services to a large customer base. Limerick man Padraig Murphy had no idea how far the company would grow when he first started out with one van doing local work. Those days, he worked under the trading name of Temple Express, before changing to All-Star Deliveries and then in 2004, we created a warehousing and logistics company All-Star Logistics Ltd.
Having being based in Rathkeale, Co Limerick, Padraig moved the business to a new build premises in Newcastlewest where he was free to add to the list of services that the company provides. These services include warehousing & logistics, pallet & crate washing as well as transport solutions which allows them cater for businesses in many different industries. Their transport solutions sees them operate a fleet of artics, rigids and vans with a dedicated and experience team of drivers ensuring that the customers’ products get to their destination safely and on time. “I have two artic trucks, two rigids and three vans on the road at the moment. Each vehicle is designated to work that suits both the customer and us,” said Padraig. Padraig added that they have recently branched into temperature controlled work meaning that new vans were also added to the fleet. "Our new temperature controlled services is not that long on the go. We invested in specialised vehicles for this and we offer our services to many industries throughout the country. Padraig and his team can locate any of their vehicles at any given time as they are all fitted with a GPS system which allows them to also keep a check on the temperature of the vehicle. With over 50,000sq ft of modern warehousing which includes 15,000 pallet spaces and a designated area for 3,000 temperature controlled pallets, it is no surprise that All-Star Logistics have plenty of enquiries about this area. “Our warehousing is always very busy. There is a sorting services, pick & pack services, Daily/Hourly Just in Time deliveries. Other services are our third party logistics service (3PL) involves the management of the flow of goods between various points. We provide a rapid response to our customers needs daily and hourly. Third party logistics is an effective way to reduce operational cost and allow a company focus on their core competencies. The newest services provided by All-Star Logistics Ltd is their own in-house crate washing service. This involves washing and drying an array of crates, plastic pallets, totes, boxes, lids and trays. To do this, they are placed through a stainless steel cleaning machine. The washing service is ideal for industries such as food, electronic, automotive, health, pharmaceutical and medical devices with everything being washed to a very high standard. "There are a lot of benefits to getting crates and pallets washed like you get quality assured hygienic instruments. We can ensure that there is no cross-contamination or product contamination, while image is everything in business today and the crates and pallets will look good, while it is also environmentally friendly." Paudie has not been afraid to invest in the business over the years and he feels that it is important to do so in order to drive the company forward. Quality is key to the success of any business and Padraig stated that it is an area that they give a great deal of attention too. “My wife Caroline is the Quality Manager and the work she does is invaluable, while we have a new member of staff Margaret, in the accounting department. “There are 38 working here in total and many of them would be here for many years. I’m fortunate to have a loyal and experienced staff and it is good to know that you can send them off on a job and it will be done to the best of their ability.